.Bassano del Grappa sits at the base of the rich in history Monte Grappa and is a gateway to the Dolomite mountains. This area provide a ride for everyone whether it be gentle hills around middle-ages towns like Asolo or the famous climb of Monte Grappa which has has been climbed by the peleton of the Giro d'italia many times during it's 100 year history with the lastest ascent being in 2014. The painted names of the riders can still be seen on the road up to the summit. Bassano del Grappa and the surrounding valleys provide the most spectacular cycling playground anyone could wish for. With Venice only a short train trip away there is the opportunity to spend the afternoon or evening there shopping or just sight seeing. First we will ensure everyone bikes is set up and ready to go then head out for a short flat ride. This is a warm up ride to ease the legs and body into moving again after. Some of you may have only just stepped off a plane, so this ride offers a great way to work out any tiredness. The ride from Bassano is not difficult but has some real hills in it. You will know they are only hills as the real mountains can be seen in the distance.On this route we cycle among the vineyards and olive groves to one of the most beautiful Italian medieval towns: Asolo. Stopping here for lunch and a look around the village before heading back to Bassano del Grappa. Whilst in Bassano del Grappa there is the option to venture into Venice for the afternoon/ evening after we have ridden in the morning. 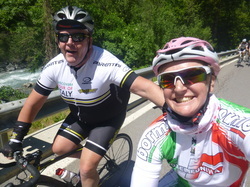 Another hilly ride but that is what Italy is all about. Today we head out towards the west of Bassano, all the climbing is completed in the first half of the ride then its down hill and flat back to the hotel. Vittorio Veneto is nestled in a ring of hills and mountains, full of great roads that are conducive to some amazing cycling. This small town ( 30.000 inhabitants) boasts one of Italy’s most beautiful Medieval settlements, like the Flaminio Square in the town of Serravalle, completely surrounded by Middle Ages and Renaissance buildings. Vittorio Veneto itself is a mine of art history treasures. The breathtaking Dolimite mountains are only a short distance away. This is the highlight ride of the tour, the experience of climbing through the 6 half tunnels of Monte Boldo will stay with you for a lifetime. Todays ride takes us over rolling hills and past the famous wineries in the heart of Veneto region. 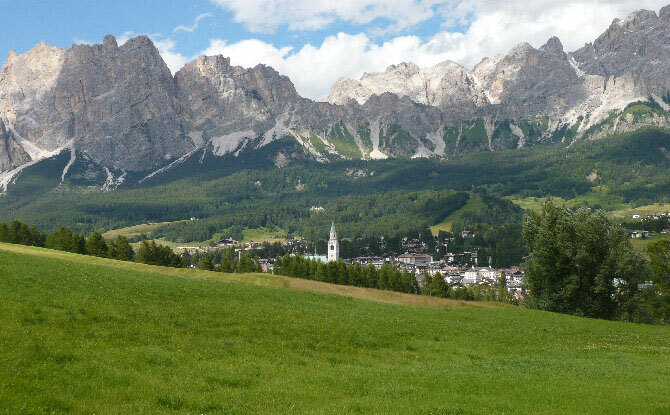 Our last ride for the tour, today we ride on the Montello known as the cycling park of Trevisio. The montello is in fact a hilly park immersed in forests on quiet roads which have become a mecca for local cyclists. Wine tasting and lunch will be at will be a local winery. A lot of fun and as much or as little riding as you want!